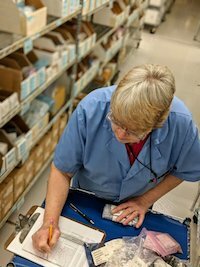 While conducting an annual physical inventory count is a common approach companies use to assess inventory levels following the completion of a full manufacturing year, it doesn’t always produce accurate results. This is because most companies will bring in temps or other personnel who aren't inventory-savvy to conduct annual counts. Even though this practice may seem efficient, it leaves room for error. Additionally, an annual inventory count will likely shut down your entire operation for however long it takes to complete. By implementing cycle count inventory management — which is the process of counting smaller subsets of inventory more regularly throughout the year — you're counting your inventory daily instead of annually, which means you’re able to isolate issues and catch and fix errors immediately. Since consistent inventory cycle counts help with accuracy, you'll be able to place more trust in your recorded inventory levels. The cost of switching from annual inventory counts to frequent cycle count inventory auditing is often a concern for companies. However, switching to a cycle count process doesn’t mean you'll need to employ a full-time cycle counter. Depending on your inventory levels and your company’s goals, having one or two employees on staff with cycle count expertise may be sufficient. How much does three to five days of counting cost in hourly labor? Also, how many employees are involved in these annual counts? How many mistakes typically need to be fixed immediately following them? How much product isn't produced during the three to five days your facility is shut down to conduct each annual inventory count? What's the cost of having your operations shut down for three to five days? How many clients are typically inconvenienced? While cycle count inventory auditing may not be the answer for all companies, you should at least weigh its pros and cons. If your current inventory auditing process isn’t working, you might be surprised at how incorporating cycle count can combine with small batch manufacturing to change the way your business operates. Contact us to learn more.